We are finally enjoying a nice warm weekend, and I was out all day working on the garden. Casey spent part of the afternoon outside too, watching me plant the flower pots and calling out to the outdoor birds. Hmmm, kind of sounds like a territorial dispute. Did anyone plant a flag on your leg? Recently, Ralph has become fascinated with the automatic dishwasher. I can't quite understand why he finds it so interesting. Every time he comes out of his cage, we have to go into the kitchen, where he points me in the direction of the dishwasher (by staring intently at it, then bobbing his head). So I have to open the dishwasher door so Ralph can look inside (while it's not running, of course). Repeat process a dozen or more times. Last night while we were inspecting the dishwasher, I put a used coffee mug inside, so then we had to double-check to make sure it was still in there. It never ceases to amaze me what will capture the attention of a parrot. When he's in the towel, and your BF is holding him, just flip the tail end of the towel over his head so he can't see who is clipping him. Then he won't know WHO to be mad at!!! #641093 Charlie, Oscar And I Are Building A Nest! It occurred to me that they may have the instinct and the desire to build nests, but because they weren't raised in a Quaker Family Unit, they may not have learned the SKILLS to build nests. So, as their surrogate mother, I decided it was my job to help them develop their nest building skills. I gathered up an assortment of sticks, twigs and vines and piled them on top of the cage. Then I started *building* a nest by weaving sticks and vines through the bars of the cage, describing what I was doing as I went along. They watched and listened very intently, and being Quakers, it took them about fifteen seconds to develop an opinion about what I was doing wrong. They both started criticizing my work and advising me on how to do it THE RIGHT WAY. Within a couple of minutes, Charlie had taken the stick out of my hand and was showing me how to do it, and Oscar was pulling one of the twigs out of my nest so he could rearrange it. When I left to come to work this evening, they were both busy collaborating on design elements on The Quaker Nest Project. They didn't even notice when I left. I'm curious to see how a Quaker nest built by a committee will turn out. How much I love you all on this forum???? It's such a breath of fresh air to be able to come here after a stressful day (or couple of hours), and unwind....thank you all so much, for making this such a great and supportive forum. He's mimicking me when I complain about him knocking his food down lol. Humans constantly worry about our diets and health. 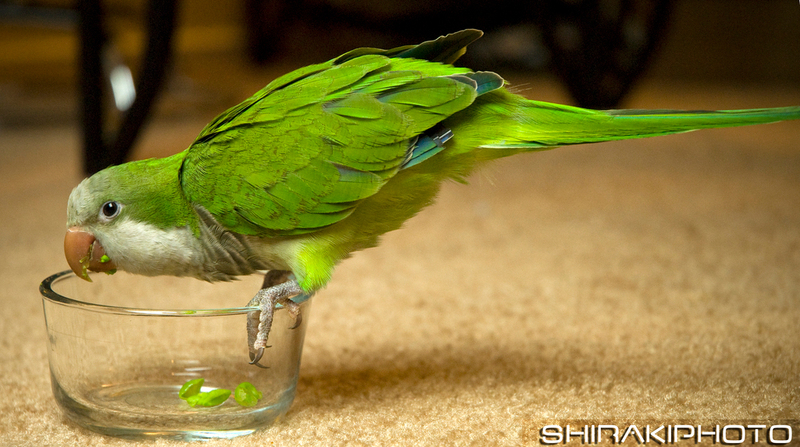 Creative parrots can use any food as an effective manipulation device. Let's start with breakfast foods. Soft food is versatile and has many uses. Never waste a bit. When your human brings you a bowl of warm soft food, don't always eat it or play in it. About once a week, examine the food and no matter how good it looks or how much you want it, look at it with contempt, then walk away without taking a single bite. Go slump on your perch while looking starved and disappointed. Slick down your feathers to make yourself look skinnier than you really are. Give your human the stink eye so he or she will try to do better in the future. On other days, dive right into that soft, mushy, messy stuff and make good use of it. Fill your beak with oatmeal, then vigorously shake your head and sling wet food everywhere. 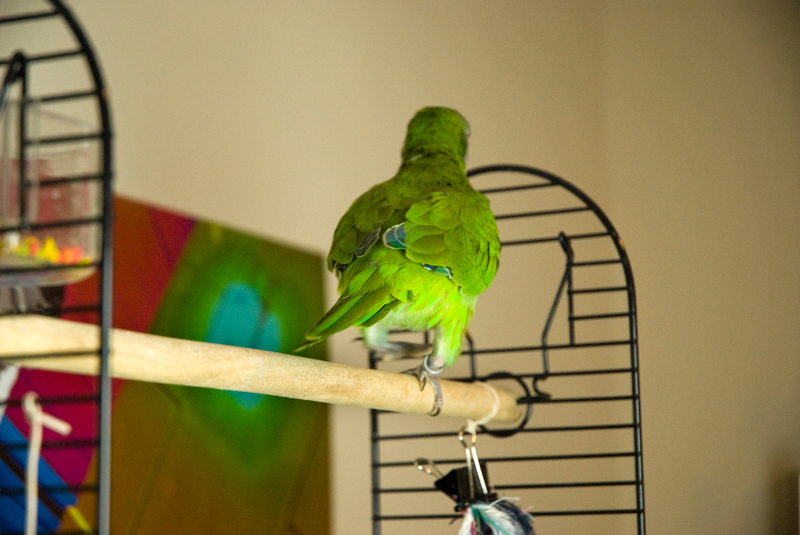 Rub what's left on your beak, on your perches and toys and the bars of your cage. Small, soft items like peas, grapes, corn and cooked rice make great projectiles and if thrown correctly will stick to walls, cages, furniture and dogs, if you have them. Later you can laugh at the dogs while they are getting the food brushed out of their hair. If you are lucky enough to get pomegranates, act delighted and let your human see you eat some so they will get you more. The kernels are fun to pop in your beak and the seeds taste great. They also make good ammo and stick to almost anything. Pasta is another favorite, especially when it's covered in red sauce. When you get this special treat, eat what you want, proclaiming loudly how much you love it and want it for dinner more often. When you are done eating, climb into the bowl and squish the pasta and sauce between your toes, get some on your face and feathers, then climb all over your cage, leaving a trail of sauce to dry on your toys and perches. Use any leftover spaghetti to decorate your room. Let dry. It will pay off later. 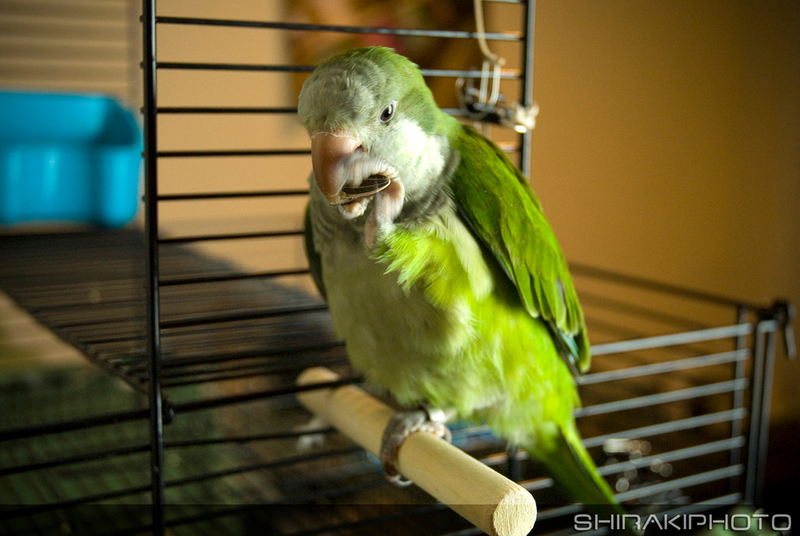 Most well kept parrots have a constant supply of pellets. These too can be used to your benefit. Eat a few, they're good for you. When you get a fresh bowl, put some in your water bowl to soak. Colored pellets are best, but if you don't get colored ones, you can add dyed toy parts to your bowl, this adds lovely colors to the water and will make your human scratch it's head in confusion. If you happen to be a large parrot you can tuck a few wet pellets into your feathers, under your wings and in the feathers on your breast. When your human finds them, he or she will think you have an eating disorder and you will get an even better menu. Don't do this too often or you'll find yourself in a travel cage on the way to a vet. When you are done tucking pellets into your feathers, go stir the contents of your water bowl, add some spinach or whatever you have a lot of. Poop in your water bowl. Poop soup is time sensitive because if your human walks by and sees it, he or she will take it away before you finish your fine art project. Fresh food doesn't stay in your cage too long either and should be used quickly. If your human is near enough, while you are busy, watch them closely and if they show signs of losing patience with you, offer them a small bite of food, if they refuse the offered goodie, climb to their shoulder and put it in their ear, their hair, or stuff it up their nose, or put it down their shirt. If they aren't amused, make kissy sounds, turn your head to the side and look like you don't have a clue what they could possibly be upset about. Dry food doesn't stick to surfaces and turn to concrete like soft food but if you are feeling energetic and creative, it still has it's uses. Dry food is much noisier than soft food. Our human cleans our cages every evening after dinner. If you have used your soft food wisely it will be dried on your toys, your perches, your cage and you. While your human is scrubbing, washing, cleaning, changing paper, scraping and mopping food off the walls and floors and giving you a bath, use the time for bonding. Give your human lots of attention, ride on their shoulders and play with them, work on their hair, remove buttons, strings or anything unsightly and keep it for yourself. If you are a re-homed bird or even if you're not, bite the human occasionally and they will reward you by saying something stupid like, "What's wrong with my angel? What are you upset about, Little Precious? How can Mommy or Daddy make it better?" When you return to your immaculately clean cage, it's a good time to inventory your things. If you would prefer a different kind of perch, chew the old one and pretty soon your human will think it's unsafe and replace it with a new and improved one. Same with toys. Now that your cage is clean, you will probably have a bowl of fresh water and a bowl of dry foraging mix. If you want more time with your human, splash all the water in your bowl all over yourself and your clean cage. A cup of water instantly becomes a gallon of water if you spread it around. Most humans will not allow you to sleep in a wet cage and they will come back to clean and dry everything, including you. Now you can look wet and pitiful. This will get you extra attention. Now the dry food, turn your head sideways and dig down to the bottom of the bowl, a quick flick of the neck will push the food over the edge of the bowl. You'll know when you've practiced this technique to perfection by how far you can make the food travel. 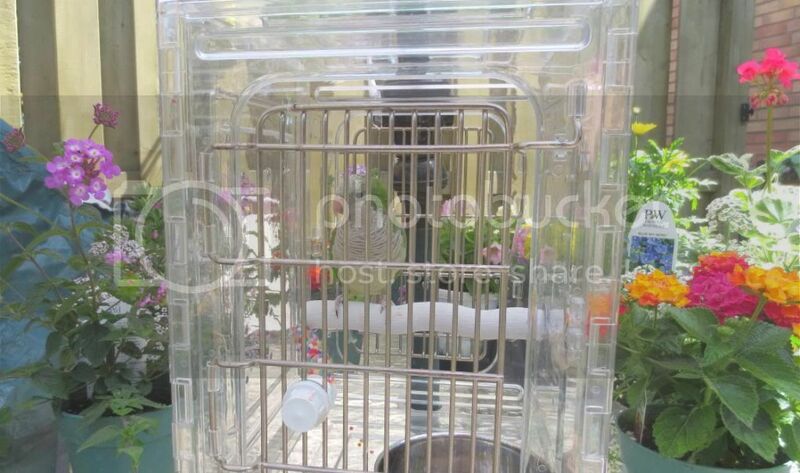 The first step will remove most of the food from the bowl , and the food will make a magical noise when it hits the floor, the walls and your neighbors, it will also decorate the fresh, clean paper in the bottom of your cage. Use your foot to pick up the remaining food and throw it with your fist as hard as you can. Banana chips make great shovels for those tiny pieces. When the bowl is completely empty, call your human while staring into your empty bowl with a bewildered, innocent look. Most of them will put a little more food in your bowl so you don't go to bed hungry. Repeat. Your human will think you hate your food and try to find items that you will actually like and hopefully swallow. This is how we got, popcorn, star anise, cinnamon and sesame sticks, crazy corn, and an occasional almond added to our menu. Your human can be trained to bring special treats to you and feed you from his or her fingers. Really well trained humans will now sit in a chair by your cage and read you a bedtime story. When that happens, celebrate, pat yourself on the back, you've done well. By now you should be exhausted from working so hard and be ready for sleep. Don't let your humans off easy, make them cover your cage, turn off the lights, TV's and stereos, close the curtains, and tell you good-night. Even if you don't talk to your human, you should learn to say, nite nite, sweet dreams or something cute like that, this will get your human to run to your cage, tell you how smart you are and generally make fools of themselves. Humans can be loveable and entertaining. They will also wake in a good mood the next day and want to make you as happy as possible. All these methods have been tested on our human and we have found them to be successful. A well trained human is such a rewarding experience. Good luck with your training. I got Kiwi in 2005. In 2011, my husband and I separated, and I was not able to bring him to the apartment where I moved. I moved in with my boyfriend, near the end of 2012. About two weeks ago, Kiwi moved in For nearly two years I did not have Kiwi, and during this time, I barely saw him. I would occasionally go to my ex's house to drop things off, pick things up, etc. However, when I did go there, I didn't visit with Kiwi because it actually hurt me too much-- I missed him, and I was too sad that I wasn't able to bring him with me. My ex did not interact with him on the level that I do. He would talk to him sometimes, and sometimes take him out of the cage, but overall, there wasn't too much interaction. Anyway, it seems that after almost two years, Kiwi remembered exactly who I am. I visited with him two times before I took him back with me, just to see how he would react, and get him used to being with me. Kiwi, who has always been very selective in terms of who he decides to like, immediately cuddled up to me, and enjoyed his head scratches. Upon bringing Kiwi home with me, he immediately settled in, and took quite a liking to my boyfriend! The most amazing part is that Kiwi uses all the words and sounds that he would make, back when he was with me, prior to 2011. Immediately, he went back to imitating my laugh, as soon as I laugh; pretending to take a dramatic breath in, as I normally do that before I attack him with kisses; whispering his name; mumbling birdie language when I have him sitting on me while I'm trying to have a conversation; and more. The size of a bird brain is quite small, but the information and memory that is retained is amazing! I am so thrilled to have Kiwi back with me. I also have a Maximillian Pionus and a Meyers. The Pionus will be moving in with me soon enough, and the Meyers, who adores my ex (for some reason, lol), will be staying with him. You never get to sleep in. You buy fruit and vegetables for the birds from a greengrocer and you check every item carefully - you buy your own fruit and vegetables from the supermarket. You can only sit down and have breakfast once you have organised the birds' breakfasts - you come last in the eating line. No phone calls must be made when quakers are having their special time with you - they hate phones as your attention should be on them. You shall speak to no-one except quakers when they are out of the cage - if you dare attempt to speak to someone, quakers will shout you down. You shall not attend to the cockatiels first - if by accident you do, you will get an almighty chomp to remind you of who is boss. Yesterday I had a terrible, terrible headache. I came home from my volunteer job at the zoo, got into my nightgown, darkened the room, took my pain pill and lay down. My little Blue Man comes over to me and croaks "I love you". Could there be any better medicine than that? #641253 Saying Something That I Didn't Teach Him!? I thought of the same commercial that Siobhan mentioned. On another parrot forum I belong to, there's a CAG who learned to say "But wait! There's more!" from TV. Parrots don't necessarily forget words they learned in the past that they no longer hear repeated. My old YCA George sometimes would come out with something he hadn't said for years. And some parrots only need to hear a word or phrase once before learning it and repeating it. However he learned it, the answer to Mr. P's question is obviously "yes." #641121 What Does Anyone Know About Goffin Cockatoos? Hey Sharyn, so happy to hear the birds from the hoarding rescue found homes so quickly! Wonderful job by everyone involved! Cockatoos in general tend to be unpredictable, unstable, very needy, loud, hard to feed, expensive to keep and often unhappy in captivity. Those are a few of the reasons so many rescues are filled to overflowing with toos. They are also notorious pluckers and screamers. Popeye is a six year old male umbrella. I'm his third Mom, he lost his first two homes due to screaming. The goffin's cockatoo is a smaller species, I know several of them and they are little clowns, funny and obnoxious. The toos are one of my favorite species of parrots but I can't tell you they are easy to care for. You've probably heard they are Velcro birds, that makes them popular to buy. They are also stunning to look at. Most aren't known for being great talkers, but they do talk. They tend to be picky eaters as a rule and need a wide variety of foods to stay healthy. They climb like monkeys and need constant foraging opportunities, they can destroy a fifty dollar toy in minutes. They need big roomy cages and a lot of time outside their cage. They produce a lot of dust and most people who keep them with other species use air purifiers for the sake of human family members and other flock members. Even the smaller species have powerful beaks and a bite delivered with intent can cause nerve damage and require stitches. That's some of the basics. They are not for everyone, do a lot of research before you adopt one. That said, I wouldn't hesitate to adopt a goffin's. I love their spirit and sense of adventure. When I adopted Popeye, a lot of people told me I was nuts among other things. I couldn't believe so many people tried to discourage me. Now I understand. I've found almost everything I was told to be true. I've been studying Cockatoos for nine months now, if I can help, let me know. Or maybe I can recommend a good counselor. If you foster, then the choice is your as to whether you like the potential forever homes or not. You have the power to decide what is right for the animal in your care. So dont worry about fostering because, believe it or not, I found out that some homes were actually better than mine and so was glad for the animal to go to people who really cared about it and could do a better job than me. If you decide to keep the animal, then so be it. All foster carers go through the same thing - sadness and upset when an animal is rehomed. You need a support group of other foster carers to help you through it. Anyway, I cant talk - I see a little Shetland pony who doesnt like people, runs away from everyone and doesnt give a hoot about anything and what do I do? Adopt her See Sharyn, we are all the same - we have these flashing signs on our foreheads that only animals can see - it says "Sucker". Congratulations Tom, Your family was adopted by a wonderful Quaker. Quakers have such a wide range of personalities that almost any behavior can be considered typical Quaker behavior. And you have a talker. Be careful what they hear. My girl is hormonal right now and even more ornery than usual. She picks on my husband constantly. He's been calling her Hannibal and I caught him standing by her cage repeating, "Hello, Clarice." A new species of quaker has been discovered - Batbird. I put a TV in the birds' room so I could watch videos, because I have a weakness for certain old TV shows that Hubby ... does not. So I can watch my Starsky and Hutch or Partridge Family or Quantum Leap DVDs with the birds and multi-task by spending time with them AND watching videos. Jade often flies over to investigate my snack of the evening and I usually give her a taste or the option of rejecting it, but she sits on Maggie's cage (which is next to my chair) to do her begging. Tonight I had ice cream and none of the birds likes that, though they usually swarm around to see what I've got before going on about their business. Tonight Jade flew over and landed on my KNEE. I offered her some, and she tasted it to be polite, but she didn't really want any (I know ice cream is not a suitable snack for parrots, but I also knew she wouldn't want any). And she sat on my knee for a few minutes and watched TV with me. This weekend, she came over and sat on my shoulder when I didn't have a snack, just to be sociable. I always expect a face chomp just in case, but I didn't get one. She pulled my hair and asked "whatcha doin'?" #634923 Who Is The Oldest Quaker On This Forum? HI everyone i finally got a computer . today as a matter of fact well i still have ERNIE the male quaker and he is this year going to be 27 years old .. and still a sweet heart ... lays on his back in my hand and rides in my shirt.. I thought I'd include a few shots of yoshi too.